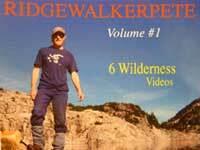 A triple-peak hiking adventure set to original music. A week of great fall weather and some time up on the peaks really got me going on this triple-peak episode. The trail starts by crossing the Chilliwack river and heads on up. After a while you cross a cable suspension bridge. The first day usually feels a bit slow with a heavy pack as I get into hiking mode. One thing I really like about these longer trips is that after few days I adjust to all the climbing ,camping and cooking routines. Everything seems so much easier when it is dry. This trip was nice and dry, to a point where I picked up my rain gear and for a moment actually contemplating the need for this weight in my pack. I only had to think back to all the cold, wet trips over the years to remember why. The hikes I like to do involve gaining altitude, camping at higher lakes, then heading out on day trips from there. Exploring the ridges and peaks. Route finding is a handy skill to have off-trail as you have to anticipate the lay of the land to find the best way. Often I will look for a game trail to get through the really nasty lower valley vegetation. As usual I enjoy checking out all the cool plants through the climate zones. Although I push along when I'm climbing it is worth it to stop and check out the sights.Patches of snow remain from last winter even though it is so hot during the day . This gulley is an example of the kind of challenges I find while I scramble up to the peak. Above the tree line the sky opens up for great sunsets and star-gazing. When you fold back the fly on my little tent you get good view on those warm nights. When the weather changes, places like this can get blasted by wind and might even get a sting of lightning. Situations I try to avoid. You can see my trusty bear spray, always handy. The bear in this area is mostly interested in the berries on a slope across the valley. One day I came upon a patch of wild Lupines as I heard the Marmots whistling to each other. It seemed like they were commenting on my presence. The music comes from a composition that I wrote as an exercise for my drum student in which I used different time signatures.At first it was intended to become several songs but I liked how they fit together. After I did the first tracks of drums, piano and rhythm guitar I decided to add a few more instruments for fun. Enjoy the video 'Beyond the Webb'. Click 'My Utube ' box above to see other videos. Enjoyed your hikes virtually since I have a fear of heights! Your Favorite Sister pointed me to your site when she posted those fuzzy owls chicks you photographed.